The University of Maryland teamed up with the USGS to create its circa 2010 tree cover, bare ground and persistent surface water. Over the span of your life, how much has the Earth changed? Quite a bit, but you probably just can’t put a number to it. Thanks to global land cover and satellite sensors like MODIS, AVHRR and Enhanced Thematic Mapper, we can finally shed some light on our changing planet. But what global land cover data sets exists? What are the best? What is their accuracy? How fine is its spatial resolution? CENTRAL PARK: The square green space in Manhattan, the Jacqueline Kennedy Onassis Reservoir and the Upper Bay that divides New York and New Jersey. FIRE ISLAND: The thin barrier island off the southern shore which protects the beach fronts of Long Island, New York. LONG ISLAND: The islands in the north-east corner of Long Island like Plum Island, Great Gull Island and Little Gull Island. Here is New York in the eyes of Sentinel-2 pinpointing the features above. How well are these features classified in the land cover maps? It’s not an easy task to classify the globe. Read below for a summary of the various land cover classification schemes available for free at your finger tips. At 30-meter resolution, this land cover is one of the finest available. The University of Maryland teamed up with the USGS to lace together its circa 2010 tree cover, bare ground and persistent surface water. Using Landsat 7 ETM+ data, its most impressive attribute is its tree cover canopy described as percentage per output grid cell. This canopy cover is used to weigh in global forest extent, loss, and gain from 2000 to 2012 such as this Global Forest Change webmap. Studies have shown that the overall accuracy of the Global Land Survey (GLS) static forest cover to be 91% with forest cover change at >88%. Echoing the accuracy in this paper, Central Park and outer islands are clearly visible. The lack of forested area in Fire island is consistent and logical. Things are looking good. At 300 meter resolution, ENVISAT MERIS sensor is the biggest contributor to the 3 epoch land cover maps (1998-02, 2003-07 and 2008-12) of the CCI Land Cover V2. Visually, you can see how it captures the thin barrier on the southern shore of long island. Despite missing most of central park (4km x 0.8km), it classifies the north-east islands impeccably. With all the other land cover classification, it’s based on image classification algorithms. Imagine a single composer writing a symphony classifying hundreds of satellite images into a land cover masterpiece. But what happens when you have thousands of artists writing their own music? When each piece synchronizes from the ginormous global community known as OpenStreetMap, you get one ridiculously accurate land use map. On top of that, it tells you if it’s residential, commercial, industrial, or any other type. There are tons of data gaps. It probably won’t capture say a deciduous tree from a conifer. But in New York, OSM Land Cover reigns supreme. The outline of Central Park is picturesque. The southern shore and north-east islands are vectorized outlines. Pan over north a couple of times and the land cover is empty. The 500-meter MODIS Land Cover Maps (17 land cover classes) describes the dominant class based on a 10 year span (2001-2010). Studies have shown interannual variability with 40% of pixels showing change in class one or more times in the 10-year span. Because of its coarseness, it misses the mark on Central Park and Fire Island. But it captures the islands quite well. However for all intents and purposes, it serves its job for weather and climate models. GLCC is based on one-year Advanced Very High Resolution Radiometer (AVHRR) using an unsupervised image classification approach. Based on land area occupied, GLCC reaches a 66.9% accuracy. When the observer can’t deduce a pixel as a “true” cover, this majority rule accuracy has an accuracy even higher at 78.7℅ throwing out those sites. GLCC is being used in a range of environmental modeling applications including the Goddard Earth Observing System Model V5 (GEOS-5). This 1-kilometer pixel size land cover classification has classified Central Park. However, it misses the boat for Fire Island and Plum Island. In hopes of resurrecting the 2000 and 2010 30-meter land cover from the National Geomatics Center of China, it’s gone missing in action. These 30-meter resolution land cover maps show global distribution of 10 major land cover classes: water bodies, wetland, artificial surfaces, cultivated land, permanent snow and ice, forests, grasslands, shrubland, bare land and tundra. It took over 10,000 Landsat satellite images to cover the entire Earth at 30 m resolution. 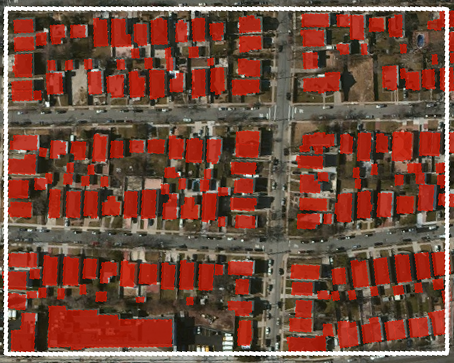 This land cover uses pixel- and object-based methods and each class is identified in a prioritized sequence. At 8 selected areas, it achieves an overall classification accuracy of 80%. The focus for the FAO’s GLC SHARE land cover is land management. This is reflected particularly in some of its classes – cropland, grassland, bare soil and mangroves. It includes artificial surfaces, water bodies, snow, treed, shrubs, herbaceous and sparse vegetation. It’s coarse at today’s standards being a bit sharper than 1km grid cells. Further, it has an accuracy of about 80% with 1087 validation sites. You can see how this classification completely misses Central Park, the majority of Fire Island and north-east islands. This is partly due to its coarse resolution. Its primary use is for better understanding land management so we’d expect better results in agricultural areas. The Climate Modeling Grid has the same roots as MCD12Q1 using the same supervised classification-tree algorithm. This data set is available to download from the USGS Earth Explorer. Although it generates the same 17-classes defined by the International Geosphere Biosphere Programme, it’s at a much lower spatial resolution (0.05°). At 5.5km pixels you can’t get the precision level compared to all the other land cover options. For the average person, it’s hard to even recognize we’re looking at New York anymore. Terrapop contains a variety of existing global land cover data sets from the already mentioned 23-class ESA GLC and MODIS 1km. On top of that, it includes a very coarse agricultural lands classification circa 2000 at 10km derived from the Global Landscapes Initiative. This contains harvested area and yield of 175 crops to better understand agricultural supply and demand. We give a tutorial in great detail how to extract data from the intuitive Terrapop interface. Which land cover do you use? Space agencies around the globe are launching satellites to meet the demand of accurate land cover of the planet. Our simple visual assessment of New York shows how much land cover varies across providers. It’s only at finer scale land cover can capture significant human activities on the land. Despite its significant gaps in data, there’s no land use as detailed as OSM. Almost like tunnel vision, it’s surprising that scientists don’t use a multi-scale, multi-data iterative approach using the best available at a given location. OpenStreetMap is like the Wikipedia of maps. As open is its key philosophy, this is also true for OSM data. Here’s how to download OpenStreetMap data. GIS is applying machine learning into areas such as classification, prediction and segmentation. Using supervised and supervised learning, artificial intelligence automatically learns through training and labeling to solve problems.